The Ford Sport Trac is no more; it and any Ford trucks smaller than the F150 will cease to be. Image from Wikimedia Commons. More Ford trucks are on the road than nearly every other automaker. The most popular full size pickup in North America is the F150, and for good reason. There have been other truck models that have sold well in the past. The Ford Ranger was the best selling light pickup for a while, but the Ranger is being retired after 2011. The only other pickup offered by Ford, the Sport Trac, is ceasing production this year. Only the F series will remain, as Ford is jettisoning as many vehicle lines as possible. As of October 2010, there won’t be another Sport Trac made by Ford, according to the Courier-Journal. Ford is shutting down the line, as it is just not selling. The Sport Trac has a cult following, but not enough to justify continued manufacture. Initially offered in 2000, sales held steady for several years at around 60,000, but afterward steadily declined afterward. Fewer than 6,000 have been sold so far this year. Trucks smaller than full size are down as a total market segment, making up only two percent of sales for the entire auto industry. It will cost Ford more to keep making Sport Trac and Ranger models, than to emphasize the F150. Ford Motor Co. is getting rid of every brand and vehicle that doesn’t sell well. According to Automotive News, Ford is paring its offerings down to no fewer than 30 vehicles. 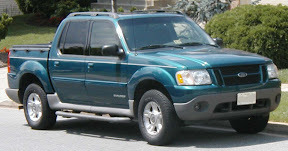 In 2006, Ford offered 97. Since then, Jaguar, Volvo, Aston Martin and Land Rover were sold. Mercury will stop existing at the end of the year. Ford is also actively paring down its current roster. The company is also retooling many of its cars so that more parts are standard. The Fiesta, which has 10 versions offered worldwide, shares 65 percent of its parts with other Ford vehicles. There won’t be a truck offered by Ford smaller than the F150 by the end of 2011, as Ford believes the turbo V6 in the new F150 will appeal to more consumers.